I don't have kids, but if I did have kids I would be reading them Gary Golio's new book Spirit Seeker: John Coltrane's Musical Journey. As soon as I saw this book I new I had to have it, even without kids. The illustrations are stunning and fairly psychedelic. The story is about Coltrane's triumph over drug and alcohol addiction and his spiritual journey to create music that would bring happiness and healing to listeners. Golio is also an addiction counselor for teens, so I would guess that he wanted to present young inner city kids with a model for overcoming addiction through art and spirituality. Trane's drug problems are not a major theme in this book for youngsters, but it is worth mentioning. "Music and religion were the twin forces that shaped John Coltrane's early years. Both of his grandfathers were Methodist ministers, and each of his parents was a skilled musician. It was his commitment to sobriety for the last ten years of his life that allowed him to pursue his vision and to create some of the most enduring music in the field of jazz." " Sometimes, when you've lost almost everything as a child, a lifeline appears that restores your faith and re-ignites your spirit. For John Coltrane, that lifeline was the saxophone, and the musical dreams it inspired. 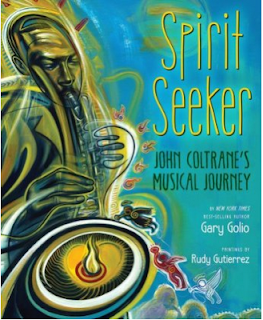 Spirit Seeker - John Coltrane's Musical Journey (Clarion/Houghton Mifflin Harcourt) captures John's struggle from lost boy to musical leader, from darkness to light. 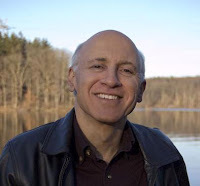 In words and images that reflect the depth of John's joy as well as his yearning for inner peace, Spirit Seeker tells the story of how art and spirituality shaped one man's talents and gave him the courage to share those gifts with the world. It's a uniquely American tale that touches on race, jazz, religion and redemption (from addiction), the power of Art, and how John's early difficulties fueled his unique vision of the Divine (A Love Supreme). Like my previous books on Jimi Hendrix (Houghton Mifflin Harcourt, NY Times bestseller) and Bob Dylan (Little, Brown), Spirit Seeker is meant to introduce a new generation of listeners to a great musical creator and his story." I love this book and if you do have kids that you are planning to introduce to Trane's A Love Supreme at some point then you do need to buy this book. Sala'am David, I remember reading a post a while back regarding metal hooks. Well I just thought I'd share the name of a place that makes straps with the mother of all hooks...lol..The place is called Manning custom woodwind,check it out.They also make cases and according to the web site custom make their own horns. Peace. The Manning strap was the first strap I tried with the big brass hook. The hook is way bigger than Joe's hook and there is really a huge difference in the sound. Some people just cannot hear the difference in the sound with the Joe's hook, but the Manning hook is drastically louder and brighter. I tried one on a gig and had to switch back after just a couple of minutes because the sound was way too bright for me. It felt like I had just added a baffle to my mouthpiece. It was louder and brighter. I would say that if you deny the effect on the sound that a strap hook makes after playing a Manning strap then you are either deaf or dead. Well here I was trying to be all hip and stuff...lol... I do agree that there is a difference with the metal versus plastic especially, in my estimation, when you are at the extremes of dynamic possibilities.I am curious..Do you notice the same or do you hear it regardless of what dynamics are involved...My apologies if I am re-hashing an old subject. I do think you can hear the difference at all volume levels. The timbre is changed, on some notes more than others, and the general response is a bit different. Charles McPherson noticed the same thing. Not exactly sure what you mean Zahir. Can you explain?